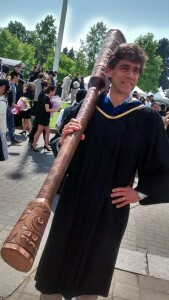 As we count down to and roll through graduation, can we please remove the mace from convocation and governance at the University of British Columbia? The mace had its day in the first 100 years of this esteemed University but that day has gone. Dalhousie University is currently embroiled in controversy over its mace, decorated as it is to demonstrate racial supremacy (“the rose, thistle, fieur-de-lys, and shamrock, depicting the major racial groups of our country”). Indigenous peoples and advocates have said enough already. Jestro grabbed a sword, a mace, and a spear and began to juggle them… The unimpressed crowd started to boo… Sweat broke out on his forehead…. He let go of the mace, and it flew across the arena. The crowd gasped and ducked… Then … bam! It hit the power grid on the arena wall. The area lights flickered, then turned off. Soon the power outage surged throughout the city. At UBC, things were questionable again this past year. With an opportunity to follow faculty and staff members’ and students’ proposal to divest from fossil fuel investments, in mid February UBC chose to continue to be a part of the problem of climate change instead of the solution. Still heavily invested. And after chalking up a $22m budget surplus, in April & May UBC jumped the line at Wholefoods to draw $7,230 in grocery bag donations. On 24 April an Open Letter signed by 110 faculty members was submitted to the UBC Chancellor Reappointment Committee questioning the process. It is time to retire the mace, symbol of aggression, authority, and war. It’s time to march to graduation ceremonies in late May and November with open and empty hands as symbolic of peace and reconciliation of controversies and roles of the President’s Office.